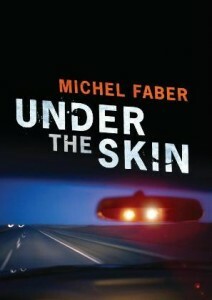 Under The Skin by Michel Faber is the weirdest book I've read in quite a while; and that's certainly saying something. In this science fiction come horror novel, the main character Isserley trawls the road looking for male hitchhikers to pick up, although early on in the novel her purpose is unclear. What is clear is that her appearance is different, she has scars criss-crossing her body and she refers to the men she is hunting as vodsels. Hailed as "An Animal Farm for the next century" and with reviews claiming it "Teases and prods the reader up a plethora of literary blind alleys before hauling them screaming towards its final, thrilling destination" I was really looking forward to something special from Michel Faber, author of The Crimson Petal and the White. Did I get it? Well sadly, no. I spent the entire book waiting for the big reveal. The explanation or the backstory explaining the difference between humans and vodsels and Isserley's own history. I was rewarded with snippets, but it was never explained to my satisfaction. I just had a look at the offerings on Wikipedia regarding Under The Skin, and the contents regarding the plot were a complete surprise to me; how could I have missed that? I have no idea, either it wasn't spelled out well or I'm a fool. Either way, this supposedly literary dynamite offering from Michel Faber was a let down for me. Surprisingly it's being made into a film starring Scarlett Johansson, so of course I'll have to watch it just to see what they do with it. It might even shed some light on the book for me.